The KONG Puzzlements Escape are three different plush puzzles for you dog. Your dog can solve the puzzle while playing and get the worm out of the apple, the flower out of the pot and the rabbit out of the hat. The plush is soft for the teeth of your dog. The KONG Puzzlements Escape allows you to mentally challenge your dog. 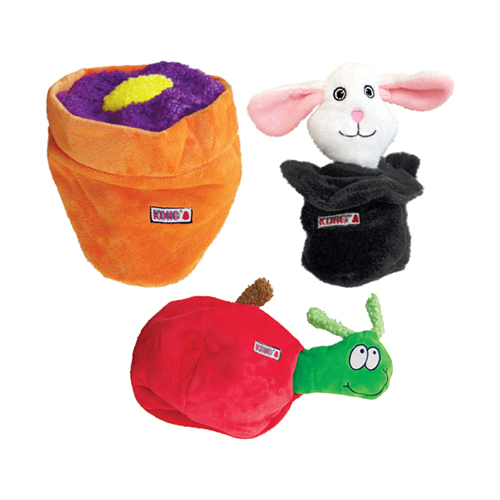 The toy consists of two parts: a flower pot, hat or apple with a worm, flower or rabbit. Your dog has to try to get the character out of its hiding place. The toy has a squeaker and crinkle paper for extra fun. Worm in Apple: maximal length 1 meter. Flower in Pot: maximal length 1 meter. Rabbit in Hat: maximal length 1meter. Have you used KONG Puzzlements Escape before? Let us know what you think about this product. Lovely things,comfortable and handy having the light to fix to the collar when out with our dogs.Good puzzles toy to.